Rural Revolution: Are they men or are they louts? In an interesting coincidence, just after posting In Praise of Men I saw this article on how Louts Are Taking Over the Planet. 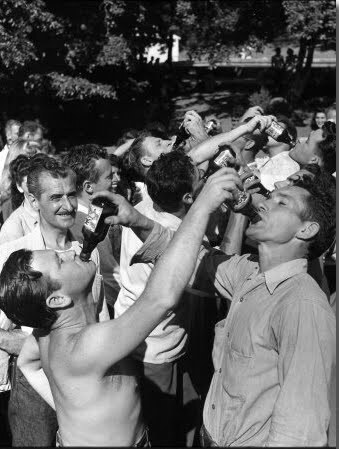 This article examines a breed of men which the writer apparently comes across with great frequently but whom I (fortunately) seldom encounter: the lout. And he laments that young men are emulating louts and therefore louts are growing in number. "The male image has gone through all sorts of transformations, especially over the last 50 years when feminism evolved and obligated men to adjust to the new circumstances of coequal women," writes author Neal Gabler. "The old strong, silent type, essentially a breadwinner and breeding stud, gradually gave way to the sensitive male, the engaged male, the homebody male who shared child-rearing and household duties with his wife...Of course, some men found this emasculating and actively resisted the process. Some tried to laugh it off. But culturally speaking, there may have been a less overt resentment that has been simmering for a long time and that may account for the recent eruption of the lout. He seems to be a form of passive-aggressive revenge against what some men see as the indignities feminism has forced upon them — indignities that have been exacerbated by economic hardship." The author points out how Louts are not tough capable men able to rebuild car engines in a single bound. Nor are they sophisticates who know their way around a wine menu. Instead, he defines a lout as "someone who is proudly stuck in a kind of adolescent parody of manhood that conflates insensitivity and machismo." So -- do you know any louts? Or do you know more Men (capitalized) than louts? I'm sure they're here in rural America, but I've never come across any I could truly call a lout. On second thought, I met one once. Nasty fellow. Yes, I am afraid I have met louts here in the midwest rural area. And truly, they were louts before the excuse of reacting to being emasculated. There may be more louts now, but they have always existed. I also know peter pan men, girly men, refined men and just regular Men as you write about. To be fair, I know the equivalent of these categories of the female persuasion too. Yes, there are country louts and city louts and suburban louts. They seem to take great pleasure in doing absolutely nothing constructive with their lives. Neal Gabler is a lout. I've met my fair share of louts, but I have to say that there are still plenty of real Men around! I'm thankful every day to have found and married a wise, responsible man who provides for our family and has a wide knowledge base of practical experience on things like building houses and fixing cars. Interestingly, I've found that a woman's choice to be a Lady (rather than a feminist) consistently tends to attract real Men and repel louts. In some cases, regular exposure to proper behavior and high standards can even reform louts, so there's still hope for the world! I agree with Roxie, there are all kinds of people (not just men) who are louts. I think that in part, louts are what they are because of a combination of factors: lack of consequences (loutish behaviour was not corrected by parents), and the mistaken idea that lack of criticism equals self-esteem (school system). By the time these people enter the realm of adult life, they are locked into a pattern of childish behaviour that they have learned is "okay". Yes! Well said, Jamie - when women act like Ladies, then those males who find them attractive are Real Men. (*sigh*) It's such a simple formula I'm surprised more women don't get it. I am a 67 year old male and in my opinion young men (12-18) need a lot of supervision and a male presence in their life. Without it they may (not always) turn to violence or the threat of violence to solve their problems. It is as natural for teen boys to choose violence to solve their problems, they are growing in strength, their self confidence far exceeds their common sense and they learn from their actions that they are effective even if they are anti-social. A properly raised young man or teenage boy is a joy and someone to be proud of. We see them all the time in all walks of life, particularly in the military. The failures grow up to be a scourge on our society and a danger to everyone they encounter. A child's mind is an empty vessel we are supposed to carefully fill with knowledge and a belief system. If we don't fill their minds someone else will. Oh the Louts....I have met many. I also live in a big college town though, and on the outskirts of that are still some nice pasture and farmland. There are a few Men, but in my area and in my experience, there aren't many. And yes, I've encountered my share over the years working in broadcast and music. Sissies and girly-dudes and surfers and guys who couldn't change their own oil if their lives depended on it. Eeuww. I was raised in a culture where the men could do pretty much everything, and I was really blessed to have a Dad who taught me the same things he'd have taught me if I'd been a boy. My sister was my mother's only child, and I was my Dad's. lol I grew up with good kitchen skills and can sew and decorate and primp and all that good stuff, but unlike my sister I can also turn a wrench, track and kill a critter, catch and clean fish, change a tire and drive a nail. I think louts get started down that road by weak prental supervision. Spoiled brats might better be applied here. Lazy and scared parents (mostly lazy) are equally to blame. A loving strong arm could set things straight but those people are about as rare as a 90 degree day in Idaho in January. Of course I know that there are hellbent kids who for whatever reason do not care. That is a mystery that we can not understand for the moment. My two nephews are both louts, I'm very sorry to say. They both treat women horribly. I have the pleasure of knowing and working with a young Man, currently 20 yrs of age, that outshines any other 20-something that I know about. He lost his father in a tragic accident during a Scouting Jamboree at age 15. He saw his father die. I don't know much of what hardships he faced during the next 5 years, with only his mother and a 17 yr old brother, but he went on to achieve his Eagle rank. He also graduated high school, and is currently taking a full load at University of Alaska in a very tech-oriented field. He also works full time, along side me, in a new-hire program that utilizes his technical skills. Nearly every day I see a Man who is prompt, polite, generous and determined as well as humorous, inquisitive and out going. I and my coworkers are proud to mentor him and aid in his studies in any way we can. He is skilled in the the ways of a woodsman and can out fish all of us, his coworkers. He hunts and cleans his own moose and caribou. In short, I am very proud to call this young man, who has overcome a tragedy, my friend and a Real Man. P.S. It also speaks volumes about the fortitude of his mother for completing the job. She's a Real Woman. God bless you Steve Davis for sharing the story of this young Alaskan with us. Your affection and esteem for him are obviously well earned and do indeed speak well of both his parents. His Mama must be so very proud of him. Bless their hearts. As owners of a small construction business we know what a rare treasure such a young employee can be and how uplifting it is to have them in our lives. They're just too few and far between. They're the future of our nation, and I appreciate knowing about your young friend.